Below is this week’s 100-word story for Friday Fictioneers. The photo prompt is courtesy of © B W Beacham. And she tolerated the pylons as the price of progress. But having a cut-price supermarket destroy her view was simply unacceptable. Along with her engineer husband George, she hatched a plan. The supermarket bosses never discovered why trolleys were being pulled into the nearby silt, along with furious customers. The gin and tonic Marjorie sipped on her balcony as the trucks took the last pieces of the supermarket away was the sweetest of her life. Great story, Siobhan. I like how your character resolved her problem. And who can blame her? Splendid work. She deserves her gin and tonic. I’m sure she would agree! Ha! Efforts rewarded! A nice tale. 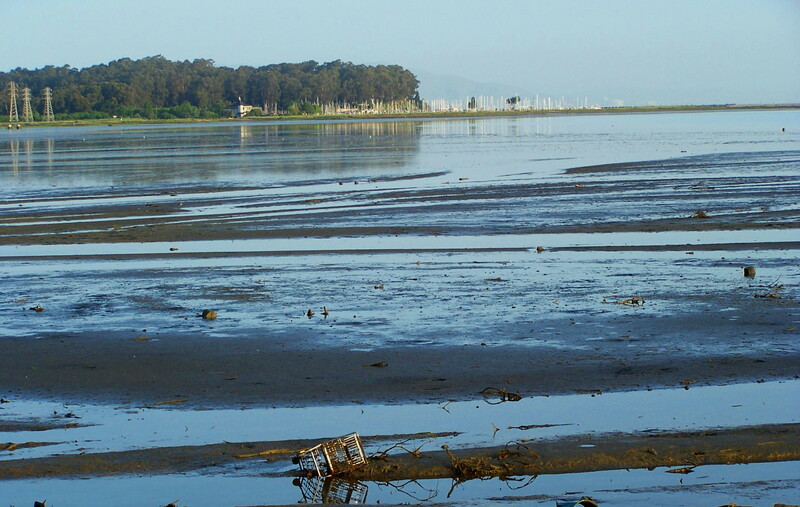 The trolleys were being pulled into the silt, along with the customers? So…I’m guessing the customers are now buried in the silt…pulled screaming to their untimely deaths. She better drink that gin and tonic quickly…I fear there will be a warrant out for her arrest soon! There’s a lady with chutzpah. Unique take on the prompt. I enjoyed it. Thank you Rochelle. Chutzpah is a new word for me, but I love it! Interesting story of how she took charge to preserve nature and her sanity. Like Karen, I really liked your phrase “petit chateau.” There was lovely energy and suspense within this story! Very well done! Now that’s inventive, Siobhan! Good job. Will you look at that sentence? That’s what gin does to you, honey. How did they do that? Good move, regardless. Good story. I think they’ll be keeping their method to themselves. George is a clever fellow who would go to great lengths to please Marjorie – for the sake of a quiet life! Lovely story. The HS2 route is going to pass quite close to my house so I might take a leaf out of your MC’s book.